Today, at the 24th International World Wide Web Conference (WWW) in Florence, Italy, our company founders, Sergey Brin and Larry Page, received the inaugural Seoul Test-of-Time Award for their 1998 paper “The Anatomy of a Large-Scale Hypertextual Web Search Engine”, which introduced Google to the world at the 7th WWW conference in Brisbane, Australia. I had the pleasure and honor to accept the award on behalf of Larry and Sergey from Professor Chin-Wan Chung, who led the committee that created the award. Except for the fact that I was myself in Brisbane, it is hard to believe that Google began just as a two-student research project at Stanford University 17 years ago with the goal to “produce much more satisfying search results than existing systems.” Their paper presented two breakthrough concepts: first, using a distributed system built on inexpensive commodity hardware to deal with the size of the index, and second, using the hyperlink structure of the Web as a powerful new relevance signal. By now these ideas are common wisdom, but their paper continues to be very influential: it has over 13,000 citations so far and more are added every day. Since those beginnings Google has continued to grow, with tools that enable small business owners to reach customers, help long lost friends to reunite, and empower users to discover answers. We keep pursuing new ideas and products, generating discoveries that both affect the world and advance the state-of-the-art in Computer Science and related disciplines. From products like Gmail, Google Maps and Google Earth Engine to advances in Machine Intelligence, Computer Vision, and Natural Language Understanding, it is our continuing goal to create useful tools and services that benefit our users. Larry and Sergey sent a video message to the conference expressing their thanks and their encouragement for future research, in which Sergey said “There is still a ton of work left to do in Search, and on the Web as a whole and I couldn’t think of a more exciting time to be working in this space.” I certainly share this view, and was very gratified by the number of young computer scientists from all over the world that came by the Google booth at the conference to share their thoughts about the future of search, and to explore the possibility of joining our efforts. Sometimes in the course of exploring new ideas, we'll stumble upon a technology application that gets us excited. Tone is a perfect example: it's a Chrome extension that broadcasts the URL of the current tab to any machine within earshot that also has the extension installed. Tone is an experiment that we’ve enjoyed and found useful, and we think you may as well. As digital devices have multiplied, so has the complexity of coordinating them and moving stuff between them. Tone grew out of the idea that while digital communication methods like email and chat have made it infinitely easier, cheaper, and faster to share things with people across the globe, they've actually made it more complicated to share things with the people standing right next to you. Tone aims to make sharing digital things with nearby people as easy as talking to them. The first version was built in an afternoon for fun (which resulted in numerous rickrolls), but we increasingly found ourselves using it to share documents with everyone in a meeting quickly, to exchange design files back and forth while collaborating on UI design, and to contribute relevant links without interrupting conversations. Tone provides an easy-to-understand broadcast mechanism that behaves like the human voice—it doesn't pass through walls like radio or require pairing or addressing. The initial prototype used an efficient audio transmission scheme that sounded terrible, so we played it beyond the range of human hearing. However, because many laptop microphones and nearly all video conferencing systems are optimized for voice, it improved reliability considerably to also include a minimal DTMF-based audible codec. The combination is reliable for short distances in the majority of audio environments even at low volumes, and it even works over Hangouts. To get started, first install the Tone extension for Chrome. Then simply open a tab with the URL you want to share, make sure your volume is on, and press the Tone button. Your machine will then emit a short sequence of beeps. Nearby machines receive a clickable notification that will open the same tab. Getting everyone on the same page has never been so easy! Many of the world’s important sources of information - books, newspapers, magazines, pamphlets, and historical documents - are not digital. Unlike digital documents, these paper-based sources of information are difficult to search through or edit, or worse, completely inaccessible to some people. Part of the solution is scanning, getting a digital image of the page, but raw image pixels aren’t yet recognized as textual content from the computer’s point of view. 1. Upload a scanned document in its current form (say, as an image or PDF). 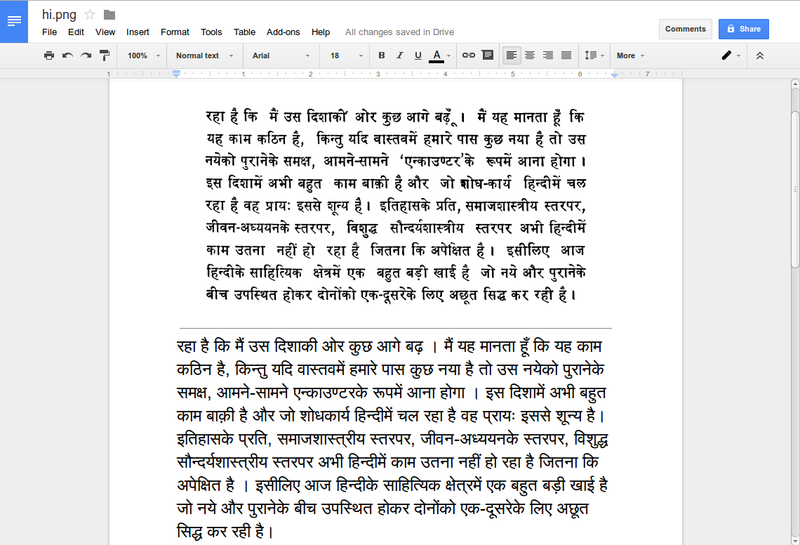 The example below shows a scanned document in Hindi uploaded to a user’s Drive account as a PNG. 2. Right-click on the document in the Drive interface, and select ‘Open with’ -> ‘Google Docs’. This opens a Google document with the original image followed by the extracted text. 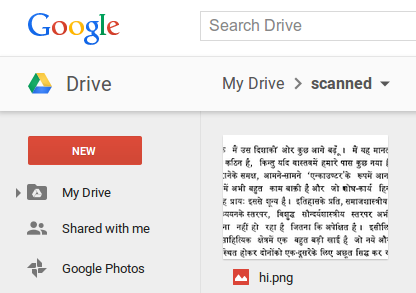 The OCR capability in Drive is also available in the Drive App for Android. To make this possible, engineering teams across Google pursued an approach to OCR focused on broad language coverage, with a goal of designing an architecture that could potentially work with all existing languages and writing systems. We do this in part by using Hidden Markov Models (HMMs) to make sense of the input as a whole sequence, rather than first trying to break it apart into pieces. This is similar to how modern speech recognition systems recognize audio input. OCR and speech recognition share some challenges - like dealing with background “noise,” different languages, and low-quality inputs. But some challenges are specific to OCR: the variety of typefaces, the different types of scanners and cameras, and the need to work on older material that may contain archaic orthographic and linguistic elements. In addition to utilizing HMMs, we leveraged many of the same technologies used in the Google Handwriting Input app to allow automatic learning of features and to give preference to more likely output, as well as minimum-error-rate training to allow effective combination of multiple sources of information, and modern methods in machine learning to minimize manual design and maximize use of data. We also take advantage of advances in internationalization and typesetting, by using synthetic data in our training. Currently, the OCR works best on cleanly scanned, high-resolution documents in the most commonly used typefaces. We are working to improve performance on poor quality scans and challenging text layouts. Give it a try and let us know how it works for you.